The Center for Research & Archaeology of the Southern Levant is a Texas and Florida based non-profit corporation which supports archaeological, geoarchaeological, and geophysical application research and discovery projects in Israel, and archaeological and historical tourism related to those projects. An important project we began in 2003 was to locate the final resting place of certain lost MIA's (soldiers Missing in Action) from the Israel War of Independence. 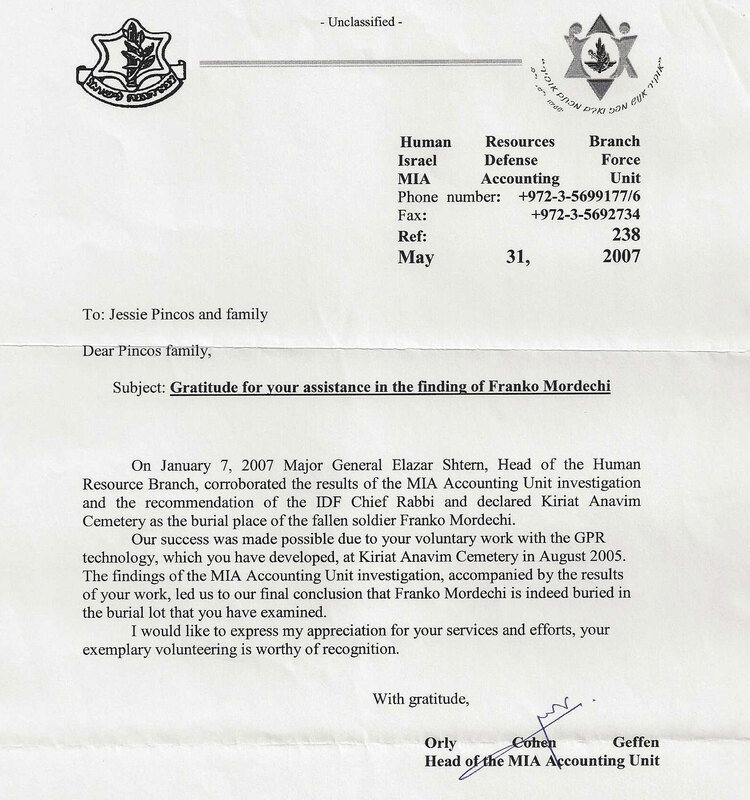 After many hours of field and historical research from 2003-2006, working with the MIA office in Israel, we were able to resolve a long mystery about an Israeli MIA, one Franco Mordecai, and bring peace and honor to the family after many years of wondering. The final end (actual location of the physical remains in the ground) of a young Israeli immigrant in 1948 who fought in the War of Independence was finally determined, through our efforts with the results approved by the Chief Rabbi of Israel, recognized by the family, and announced to the public on Israel Independence Day, Yom Ha'Atzma'ut, in 2007. This event brought closure to the family, the neshama (soul), and was motivating to Klal Yisrael. Click here for photos and full technical description of the first major study completed. From the last accounting we were given, there are a total of at least 128 fallen soldiers with no headstones, from the days of early Israel up to the present. Of this number 47 are thought to be in similar geologic circumstances which would have a high probability of being located using our geophysical survey techniques, given that we have the means and resources to focus on the task. The stories of all 128 need to be fully researched, documented, and told. The geophysical study for the first has been completed, and a study begun for the second. The memory of these individuals who gave their lives for Israel needs to be recorded; their stories should be a matter of record for their progeny, their families, and for all of us that follow. Heading the project as the Principal Investigator is Dr. Jessie Pincus, an American-Israeli geoarchaeologist who has spent the last decade involved in pristine high quality Ground Penetrating Radar (GPR) projects in Israel, bringing a level of quality and reputability to GPR in archaeology that has not been seen before. She recently completed her PhD at Bar Ilan University and is currently completing a post-doctorate at Texas A&M University where she is allied with its Department of Geology and Geophysics, as well as its Department of Recreation, Park & Tourism Services. Zvi Bielski ztl, son of Zus Bielski of the Bielski Partisans, best characterized in the recent film Defiance and documented in the book The Bielski Brothers by Peter Duffy, was working with us in this endeavor. Present the stories in a documentary film. We are seeking funding and support to complete this worthy project. A detailed proposal is available and can be supplied upon request. Help us to remember, and to tell the untold stories of our unsung heroes. if you are interested in participating! hosting, and maintenance are provided by Mnemotrix Systems, Inc.